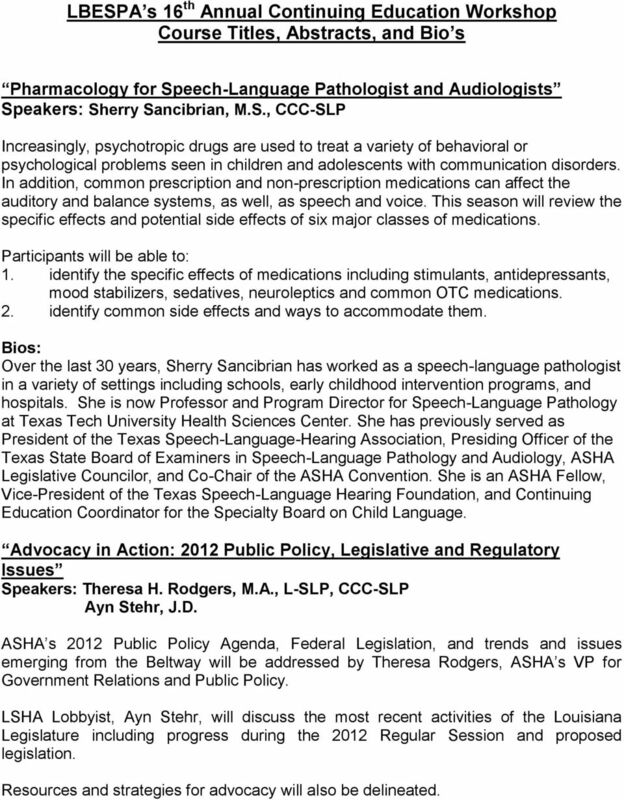 Download "LBESPA s 16 th Annual Continuing Education Workshop Course Titles, Abstracts, and Bio s"
1 LBESPA s 16 th Annual Continuing Education Workshop Course Titles, Abstracts, and Bio s Pharmacology for Speech-Language Pathologist and Audiologists Speakers: Sherry Sancibrian, M.S., CCC-SLP Increasingly, psychotropic drugs are used to treat a variety of behavioral or psychological problems seen in children and adolescents with communication disorders. In addition, common prescription and non-prescription medications can affect the auditory and balance systems, as well, as speech and voice. This season will review the specific effects and potential side effects of six major classes of medications. 1. identify the specific effects of medications including stimulants, antidepressants, mood stabilizers, sedatives, neuroleptics and common OTC medications. 2. identify common side effects and ways to accommodate them. Bios: Over the last 30 years, Sherry Sancibrian has worked as a speech-language pathologist in a variety of settings including schools, early childhood intervention programs, and hospitals. She is now Professor and Program Director for Speech-Language Pathology at Texas Tech University Health Sciences Center. She has previously served as President of the Texas Speech-Language-Hearing Association, Presiding Officer of the Texas State Board of Examiners in Speech-Language Pathology and Audiology, ASHA Legislative Councilor, and Co-Chair of the ASHA Convention. She is an ASHA Fellow, Vice-President of the Texas Speech-Language Hearing Foundation, and Continuing Education Coordinator for the Specialty Board on Child Language. Advocacy in Action: 2012 Public Policy, Legislative and Regulatory Issues Speakers: Theresa H. Rodgers, M.A., L-SLP, CCC-SLP Ayn Stehr, J.D. ASHA s 2012 Public Policy Agenda, Federal Legislation, and trends and issues emerging from the Beltway will be addressed by Theresa Rodgers, ASHA s VP for Government Relations and Public Policy. LSHA Lobbyist, Ayn Stehr, will discuss the most recent activities of the Louisiana Legislature including progress during the 2012 Regular Session and proposed legislation. Resources and strategies for advocacy will also be delineated. 4 1. knowledge of the effects of minimal hearing loss on school age children and will be able to use several different amplification options available to help this population. 2. knowledge of the effectiveness and safety of different types of personal headphones and earphones when used in noisy environments.. Phyllis R. Butler is currently the Program Consultant at the Louisiana Department of Education (LDOE) who supervises Speech-Language, Dyslexia, and Section 504 programs in Louisiana s schools. Prior to employment with the LDOE Phyllis spent over fifteen years working as a speech-language pathologist in Germany, Texas, Missouri, and Louisiana, primarily serving students in the public school setting. 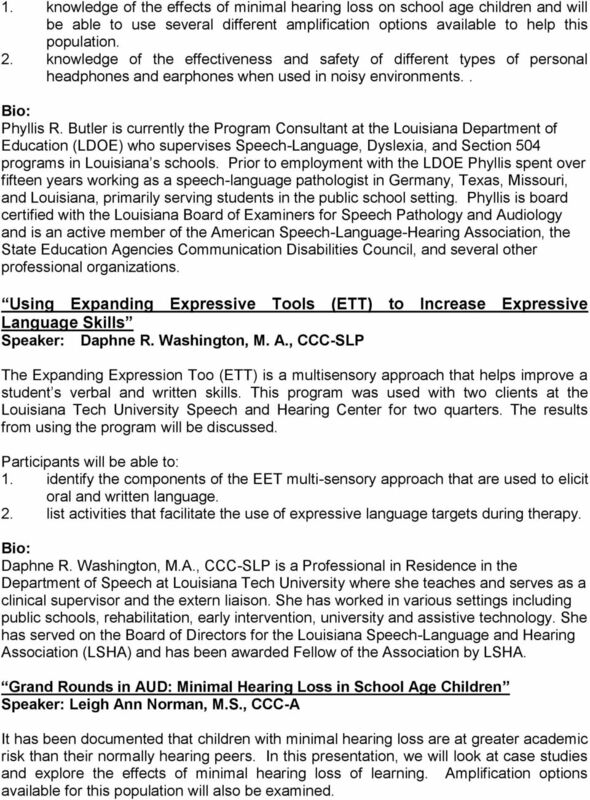 Phyllis is board certified with the Louisiana Board of Examiners for Speech Pathology and Audiology and is an active member of the American Speech-Language-Hearing Association, the State Education Agencies Communication Disabilities Council, and several other professional organizations. Using Expanding Expressive Tools (ETT) to Increase Expressive Language Skills Speaker: Daphne R. Washington, M. A., CCC-SLP The Expanding Expression Too (ETT) is a multisensory approach that helps improve a student s verbal and written skills. 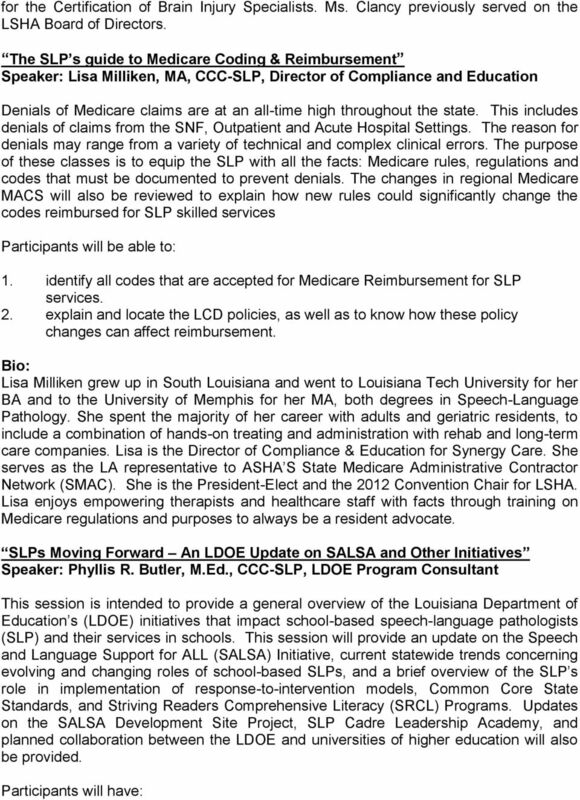 This program was used with two clients at the Louisiana Tech University Speech and Hearing Center for two quarters. The results from using the program will be discussed. 1. identify the components of the EET multi-sensory approach that are used to elicit oral and written language. 2. list activities that facilitate the use of expressive language targets during therapy. Daphne R. Washington, M.A., CCC-SLP is a Professional in Residence in the Department of Speech at Louisiana Tech University where she teaches and serves as a clinical supervisor and the extern liaison. She has worked in various settings including public schools, rehabilitation, early intervention, university and assistive technology. 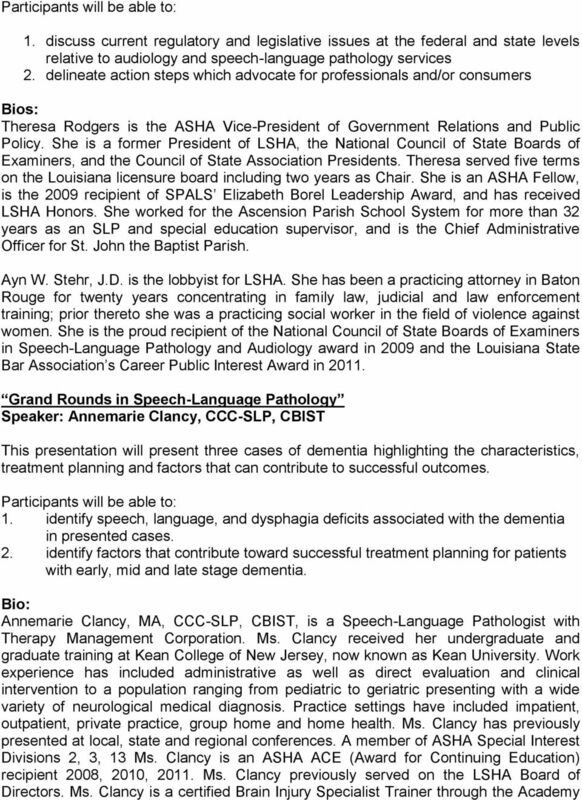 She has served on the Board of Directors for the Louisiana Speech-Language and Hearing Association (LSHA) and has been awarded Fellow of the Association by LSHA. 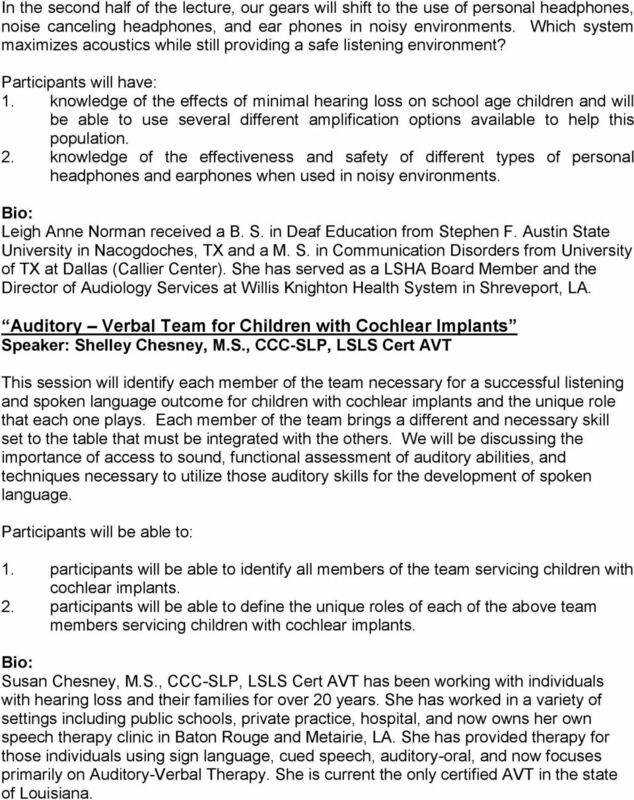 Grand Rounds in AUD: Minimal Hearing Loss in School Age Children Speaker: Leigh Ann Norman, M.S., CCC-A It has been documented that children with minimal hearing loss are at greater academic risk than their normally hearing peers. In this presentation, we will look at case studies and explore the effects of minimal hearing loss of learning. Amplification options available for this population will also be examined. 5 In the second half of the lecture, our gears will shift to the use of personal headphones, noise canceling headphones, and ear phones in noisy environments. Which system maximizes acoustics while still providing a safe listening environment? Participants will have: 1. knowledge of the effects of minimal hearing loss on school age children and will be able to use several different amplification options available to help this population. 2. knowledge of the effectiveness and safety of different types of personal headphones and earphones when used in noisy environments. Leigh Anne Norman received a B. S. in Deaf Education from Stephen F. Austin State University in Nacogdoches, TX and a M. S. in Communication Disorders from University of TX at Dallas (Callier Center). She has served as a LSHA Board Member and the Director of Audiology Services at Willis Knighton Health System in Shreveport, LA. Auditory Verbal Team for Children with Cochlear Implants Speaker: Shelley Chesney, M.S., CCC-SLP, LSLS Cert AVT This session will identify each member of the team necessary for a successful listening and spoken language outcome for children with cochlear implants and the unique role that each one plays. Each member of the team brings a different and necessary skill set to the table that must be integrated with the others. We will be discussing the importance of access to sound, functional assessment of auditory abilities, and techniques necessary to utilize those auditory skills for the development of spoken language. 1. participants will be able to identify all members of the team servicing children with cochlear implants. 2. participants will be able to define the unique roles of each of the above team members servicing children with cochlear implants. Susan Chesney, M.S., CCC-SLP, LSLS Cert AVT has been working with individuals with hearing loss and their families for over 20 years. She has worked in a variety of settings including public schools, private practice, hospital, and now owns her own speech therapy clinic in Baton Rouge and Metairie, LA. She has provided therapy for those individuals using sign language, cued speech, auditory-oral, and now focuses primarily on Auditory-Verbal Therapy. She is current the only certified AVT in the state of Louisiana. THOMAS ALVIN FIELDS 305 South Pasadena Kingsville TX 78363 HOME- (361) 592 2058 E-MAIL--tfield6868@yahoo.com; kftaf00@tamuk.edu EDUCATIONAL BACKGROUND Ozona High School-Ozona, TX--------------------------------------------------------1961. Job Descriptions. All jobs with Heart to Heart Hospice require reliable transportation as well as valid and current auto liability insurance.